Q: What is eMachineShop and how are you different from a traditional machine shop? A: When using a normal machine shop, many steps and sometimes many different vendors are needed to turn your idea into finished parts. 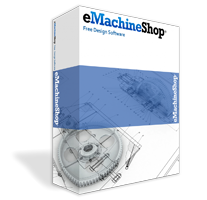 eMachineShop replaces the traditional machine shop with an online manufacturing service where we quote your design, manufacture the parts, and ship directly to your home or business. Use our FREE CAD to design and order your parts in minutes or get a manual quote via a file from a popular paid CAD application like Solidworks or AutoCAD. Q: What CNC machines and manufacturing processes does eMachineShop use? A: To create your parts, we use CNC mills, laser cutting machines, 3D printers, waterjets, wire EDM machines, plastic injection molding, photochemical milling, CNC turning, turret punching, and more. See our CNC Machining Services page to view the full list. Q: Do you offer secondary finishing on an order of custom parts? What if I need finishing on parts I already have? A: eMachineShop offers a wide range of secondary finishing options for your order, including powder coating, anodizing, electroless plating, abrasive blasting, metal brushing and grinding. Take a look at our secondary finishing capabilities for the full list. If you need finishing for something that eMachineShop did not manufacture, submit pictures and the details of your request through our quote form and we’ll get back to you ASAP. Q: Where is eMachineShop located? A: Our main manufacturing facility is located at 31 Industrial Ave, Mahwah, New Jersey, USA. A: We ship from our facility in Mahwah, NJ and our primary courier is UPS. Q: Is there a minimum or maximum order quantity? A: You can order anything from 1 part to 100,000+. Please contact us regarding any special or large orders for preferential pricing. A: Monday through Friday, 9 am to 5 pm EST. You can place orders on eMachineShop.com or through eMachineShop FREE CAD 24/7. Q: What is your free shipping policy? A: Free shipping is automatically offered to orders shipped within in the contiguous United States. A: We accept MasterCard, Discover, Visa, American Express, checks, and money orders.